Toshiko Kinjo asking the members from the South Sea Islands for information about her sister. 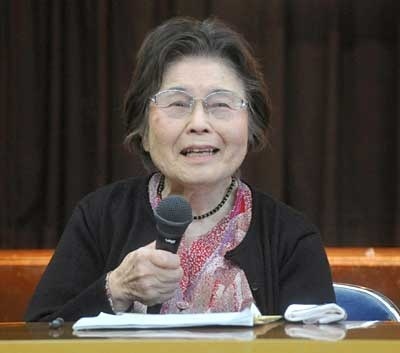 Eighty-one-year-old preschool director Toshiko Kinjo is looking for her sister who she was separated from during the war in Saipan. Her sister, Etsuko, was one year old at that time. Kinjo attended a meeting on January 27 in Naha City held by a plaintiff group that claims compensation for victims of the war in the South Sea Islands. Kinjo shared her experience of becoming a war orphan and getting separated from her sister, and she called for information. If you have any information, please contact Ryukyu Shimpo at 098(865)5158.